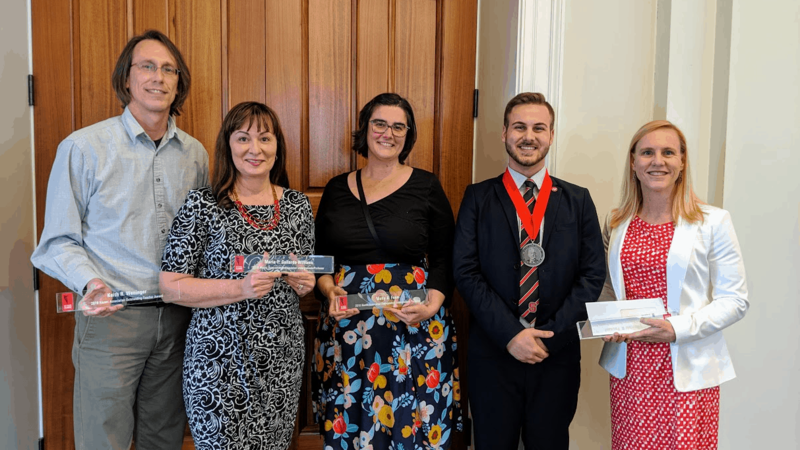 Nine members of the College of Sciences community were recently recognized by NC State with 2018-19 teaching, research, outreach, leadership and excellence awards. Among the faculty honors given out by the NC State Alumni Association, five of 22 winners were from the College of Sciences, tying with the College of Humanities and Social Sciences for second-most among NC State colleges. Molly Fenn, teaching associate professor and assistant department head of mathematics, and Maria Gallardo-Williams, teaching associate professor of chemistry and director of the organic chemistry labs in the Department of Chemistry, received the Alumni Association Distinguished Undergraduate Professor Award. This award is one of the most prestigious undergraduate faculty awards given on campus. 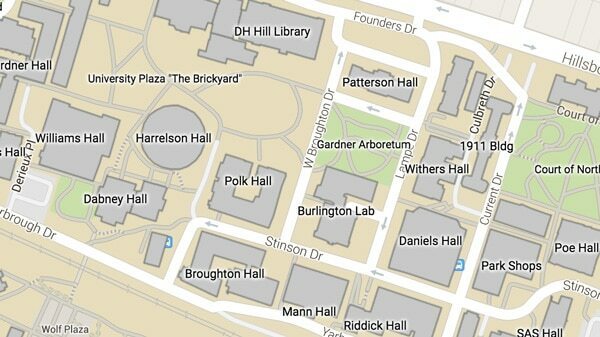 Recipients retain that title as long as they are members of the NC State faculty. Pictured (from left) are Keith Weninger, Maria Gallardo-Williams, Molly Fenn, Noah Riley and Heather Patisaul. Heather Patisaul, professor of biological sciences, received the Alumni Association Outstanding Research Award, which honors faculty for making significant advances in their fields and mentoring other research faculty. Recipients receive membership in NC State’s Research Leadership Academy for as long as they are at the university. Lindsay Zanno, assistant research professor of biological sciences and head of paleontology at the N.C. Museum of Natural Sciences, received the Alumni Association Outstanding Extension and Outreach Award. The award is given to faculty who make an outstanding effort to bring research and technology to the people and businesses of North Carolina and the nation. Keith Weninger, professor of physics, received the Alumni Association Outstanding Teacher Award. This award recognizes excellence in teaching at all levels. Recipients of this award become members of the Academy of Outstanding Teachers for as long as they remain on the NC State faculty. College of Sciences 2019 Awards for Excellence winners Alan Porch (left) and Wall Crumpler. Ghada Rabah, teaching associate professor of chemistry, was recognized with the Outstanding Teacher Award and also inducted into the Academy of Outstanding Teachers. Noah Riley, a senior in biological sciences, was among five students to receive the Mathews Medal. The award, named for Walter J. Mathews,NC State’s first student, honors graduating seniors who are leaving the university a better place because of their leadership. 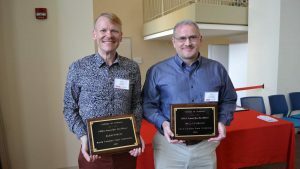 Alan Porch, business officer in the Department of Mathematics, and Wall Crumpler, LAN administrator in the Department of Biological Sciences, were recognized as the college’s winners of Awards for Excellence, NC State’s highest honor for non-faculty employees. They will be recognized at a university-level awards ceremony in June with the other 2019 unit winners.